Spanish house Loewe has launched Solo Loewe Origami, a new fragrance for men. Solo Loewe Origami is a flanker to 2004′s Solo Loewe and follows 2017's Solo Loewe Esencial. Inspired in the folds, the geometric shapes and the interplay of volumes of the age-old Japanese art of Origami, we introduce the new LOEWE SOLO fragrance. The notes feature Wet Stone Chord (basil, rosemary, cardamom), Dry Wood Chord (musk, amber, vetiver, patchouli), Fresh Chord (lemon, bergamot) and Floral Mediterranean Chord ( lavender, geranium, lavandin). 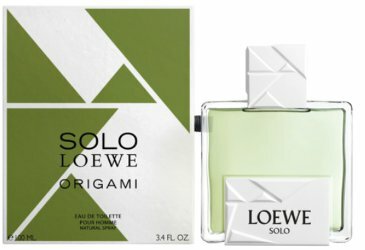 Solo Loewe Origami is available in 50 and 100 ml Eau de Toilette. I like the bottle cap! Interesting way to list notes. Wet stone and dry wood sounds pretty good. Basil seems to be having a moment. Mugler just released a basil based fragrance. My experience with the Solo flankers is anything but “delicate” per the description. One spritz and the guy at the gas station down the block can smell you. The cap of that bottle is cute! Oh man… the amount of typos I made today on this blog ???? Oh my golly. The Loewe bags this year are stunning. Three words: AH MAZE ING. But yes would require a second mortgage. ???? Yes, the bags are incredible. I think I might be in the minority here on the design. While I like the box and bottle, they look like Tangrams! (Or a nautical motif.) There’s soooo much you could do with an origami-inspired design. They really fell short on that front, IMHO. Wow! I like the sound of the notes in the fragrance and I ADORE origami. And that video, so fun. I hope they do a bunch of flankers of this flanker so there will be more origami perfumes. I’m adding this one to my never-ending list of scents I would like to sample but probably will never find, haha.